Posted 10/18/2017 7:04am by Tim Livingstone. We have had a total crop failure on our fall broccoli crop for the first time in 9 years of growing it commercially. Plants looked great but the centers were all eaten out. After researching the issue we've learned it is an insect called the Swede Midge which came over from Europe to Ontario in 2000. Since then it has been spreading to Quebec, Nova Scotia, and the northeastern US. 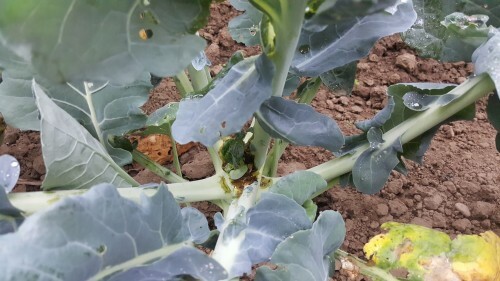 It is a highly destructive pest for most plants in the Broccoli, Cabbage, Cauliflower, Kale, and Kohlrabi family. This year it has impacted us primarily in Broccoli, Kohlrabi, and Brussels sprouts where cabbage and cauliflower have been largely unaffected. We will have to change the way we grow these crops and use covers for much longer to keep the insects off. It is also possible that we will have to quit growing Brussels sprouts all together since they take so long to develop that it may not be possible to keep them covered. A global food system has many advantages but it also carries the risk of pests and diseases moving to new locations where they don't have natural resistance or predators. The good news is that because we grow so many crops the boxes will still have a good variety and we will get through ok. Hope everyone is enjoying all the Cauliflower!